Two pacifics, one with a star emblem on its smokebox, flank Baldwin 0-6-0ST no. 12, later no. 187. The table below shows the locomotive stock as recorded in 1923 (1). A much longer list of individual locos that worked on the line, by Reg Carter, is in an appendix page. 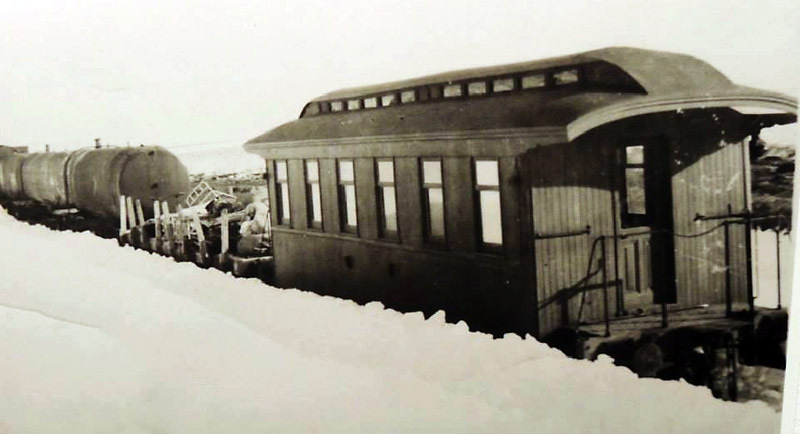 As with the Puerto Deseado line it soon became apparent that neither extensions to the line nor rapid development of the area were going to help build up traffic. Eventually the railway settled down to work for many years with just four of the class 12M 4-6-2s, nos 354, 355, 362 & 365, and a couple of the class 11S 2-8-0s. Eventually 5 Drewry railcars (operable in multiple) and 3 Ganz railcars (operable only singly) arrived to cover the passenger workings. 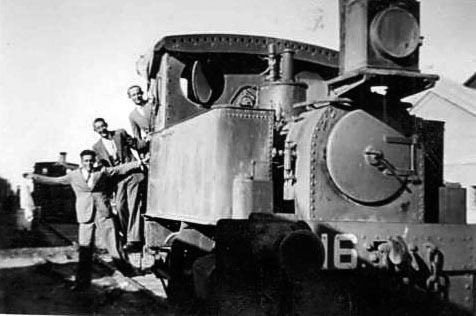 In addition there were various tank engines working C. Rivadavia port, though these were owned by the port rather than the railway and are covered in Chapter 13. One of the 12M class pacifics. There were three batches of these, built by Maffei, Cockerill and Haine St. Pierre. They had detail differences. 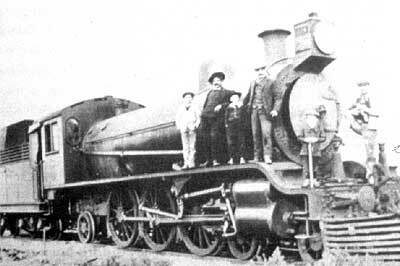 A later photo of pacific number 362, showing the smaller electric headlight later fitted. 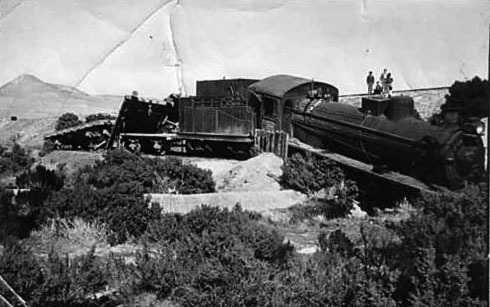 The following photo from the Patagonian Mosaic archive maintained online by Dickinson College shows a pacific loco come to grief through a derailment whilst at the head of a freight train (5). The location and date are unknown. The FCE purchased a number of small second-hand locos for use during the construction works of each of the Patagonian lines. 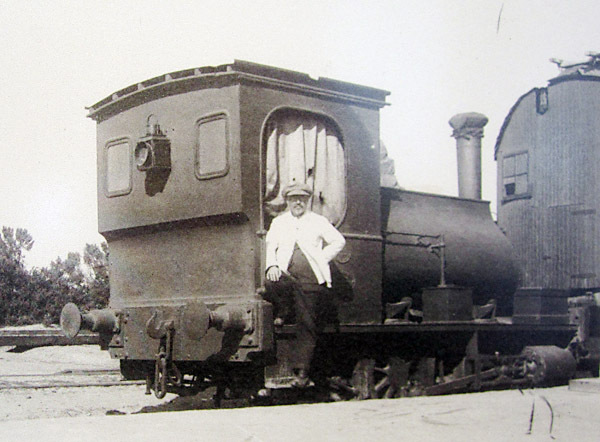 This is one of two Batignolles 0-6-0Ts, numbered 16 and 17, bought from the Beltran Cavalry Depot though they had originally been built for the NW Argentine railway in 1890. They were later renumbered 185 and 186, but were off the FCE stock-list by 1934. However, they might possibly have been transferred to port ownership. Another photo of one of this pair is displayed in Chapter 13 under the Comodoro Rivadavia port heading. This distinctive 0-4-0ST with an ogee tank is an ex FCS class 3A, built by Neilson. Whilst the source suggested that the photo was taken at Comodoro, the trees and bushes in the background leave room for doubt. The scrapline at Km 5 contained interesting relics through until the 1970s. In this view by Bob Whetham we can see Kitson 0-6-2T no. 10 on the left, and a Batignolles or Gouin 0-6-0 in the centre. 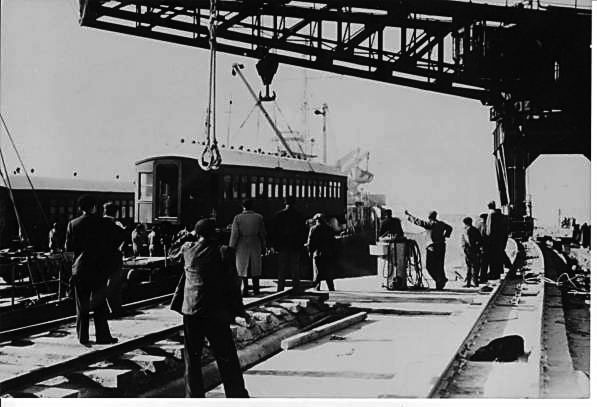 Both the Comodoro Rivadavia and the Puerto Deseado lines received petrol and then diesel railcars. These operated almost all passenger services, greatly reducing running costs. They were mostly single class vehicles - labelled 'Clase unica' rather than first or second. 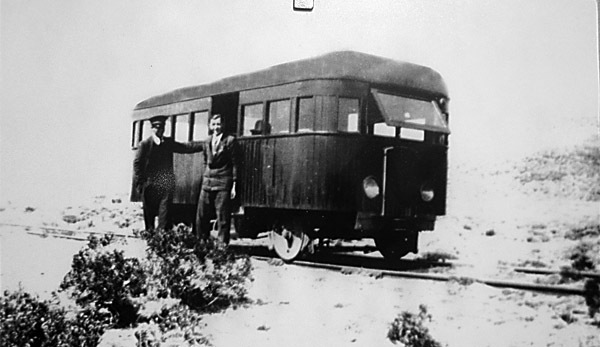 No details are known of this early four-wheeled railbus with a lightweight luggage trailer (7). 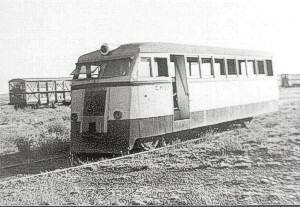 This is a later railcar, probably one of those built at Puerto Madryn in 1952. Nos. 66 and 67 worked on the Puerto Deseado line, but the numbers of those working from Comodoro Rivadavia have not yet been discovered. Eventually these primitive early vehicles were replaced by more sophisticated stock brought in from further north. A 1959 report records that the C. Rivadavia line had 5 Drewry cars and 3 from Ganz of Hungary, whilst the route from Pto. Deseado to Las Heras had just the 2 Drewry units. The same report suggests that the cars needed reinforcement by others since most trains at the time were full to capacity. These later cars were known to local people as 'Las Chanchas' or 'the pigs', probably as a result of their bulbous shapes. 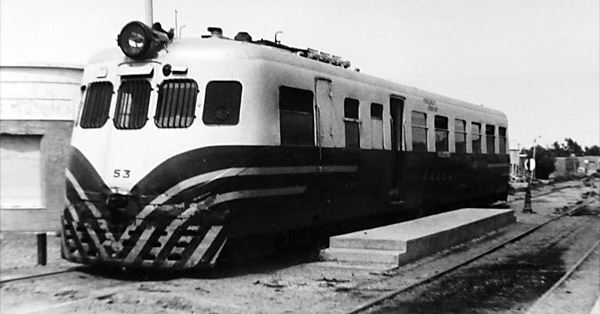 These were 1938 built single cars constructed for Buenos Aires suburban services, particularly about La Plata, and from La Plata to Coronel Brandsen and Magdalena, and distributed elsewhere in 1951. An unfortunately out of focus shot shows a Drewry car when new, and below is a shot taken in FC General Roca times on the Comodoro Rivadavia line. A head-on collision between a Ganz and a Drewry car unfortunately occurred at some point, possibly on the Astra branch. No details of casualties are known but these photos have surfaced via the Dickinson College archive (10). A third photo, not reproduced here, shows the name 'F. C. PATAGONICO" on the side of one of the cars, so the date is likely to to have been during the late 1940s or the 1950s. 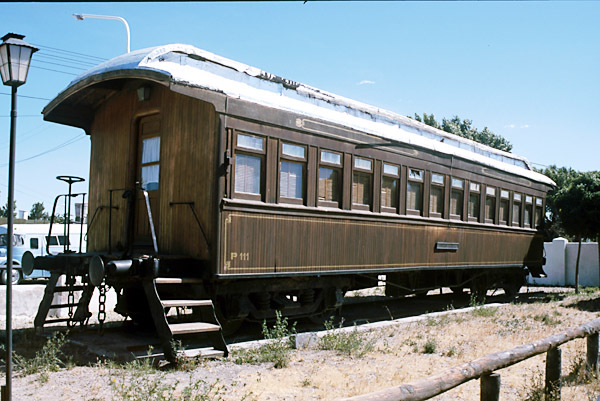 NB The Drewry railcars were built with two classes of seating, first and second, but were not used in this form on the Patagonian lines. 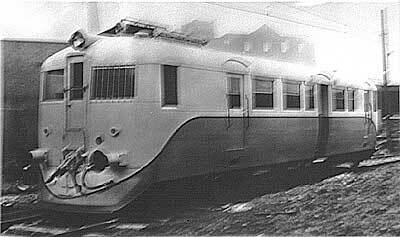 The line also received railcars built by Ganz in Hungary. 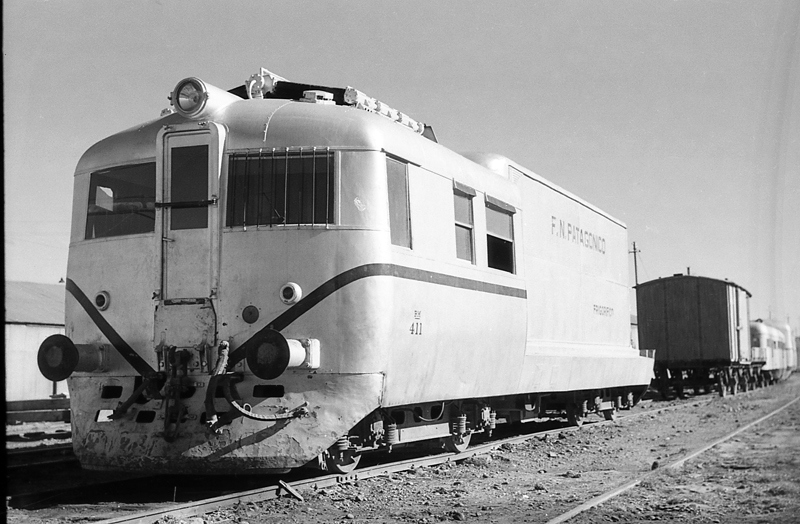 In 1935 the FCE ordered a varied batch of 35 units for all three of the main Argentine gauges. 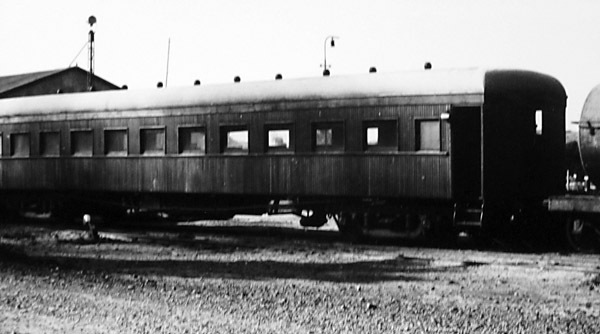 The only three broad gauge cars (CM1 to CM3) were for use in Patagonia. Of these three, CM3 definitely went to the Bariloche line first, for use between Viedma and Valcheta, though it later arrived in Comodoro Rivadavia. 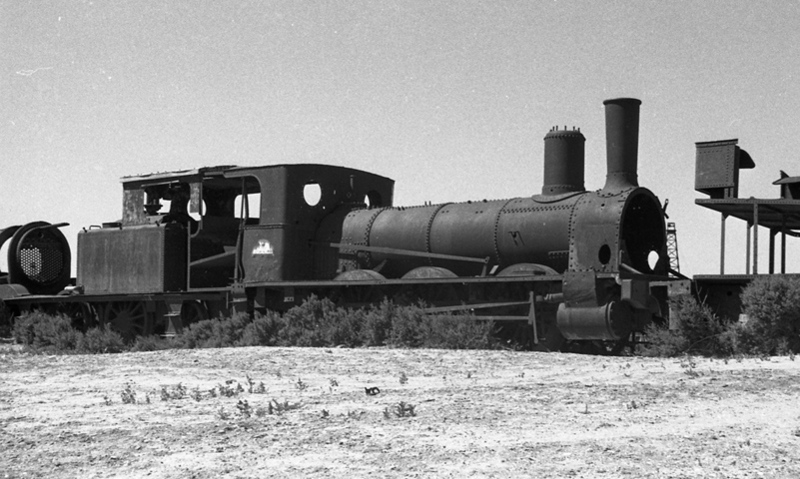 CM1 and CM2 were intended for use one each at Comodoro Rivadavia and Puerto Deseado but may both have been at Comodoro Rivadavia from the beginning. 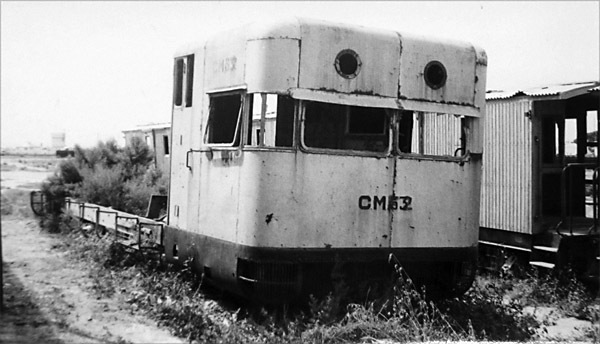 Certainly by 1959 all three units were here.The photo below shows car CM2 at the KM 5 workshops, and was taken by Marcelo Arcas. 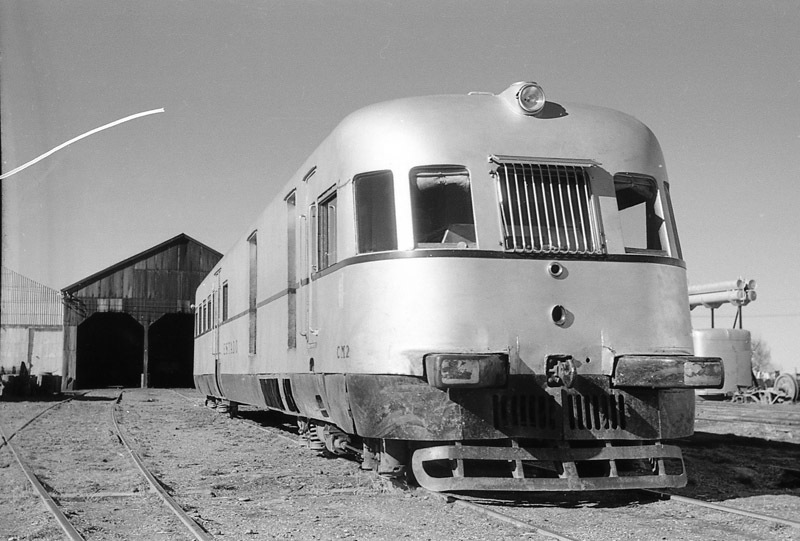 In addition, one or possibly two from a Ganz batch of cars (1054-1059, later 2401-6) originally supplied to the Buenos Aires & Pacific Railway in 1937, much later were transferred to Comodoro Rivadavia. The following photo shows one of these cars in FCGR livery as CM53. The other was CM54. They can be identified by having no side buffers at all. Their original electro-pneumatic couplers had been replaced by a conventional hook and links on arrival in Patagonia but they never received any buffers. This unfortunately meant that they could only be used singly. A final Ganz coche motor was from a second BAP Railway batch built in 1938 (1060-1067, later renumbered 2409-2416). No. 2411 arrived after use on the FC General San Martin and retained its no. 2411 in Patagonia. It too will have looked like the above picture, with no side buffers. One of the ex BAP Ganz cars still exsts in the Comodoro Rivadavia area, for some years used as a restaurant at the race course in Rada Tilly, and now adjacent to the riding school It looks rather different from the car illustrated above, and the end windows may well be a later modification. 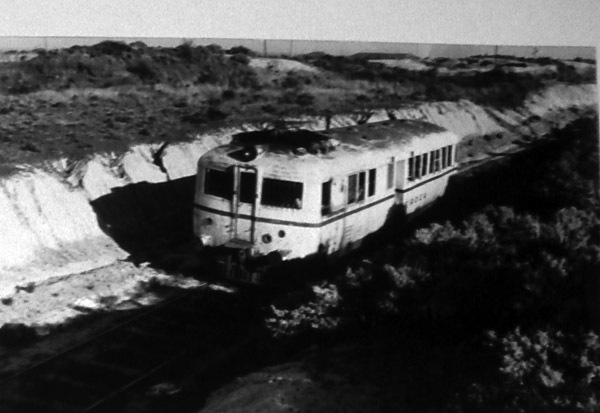 The grounded body of a Drewry car lay alongside it in 1984, but it is not known whether it remains there. A number of experiments were made with freight carrying railcars, though how long these were in use is uncertain. The picture immediately below shows a container carrying diesel railcar, modified at Remedios de Escalada from one of the Drewry passenger cars. By 1977 this lay at Talleres outside Comodoro Rivadavia with its cab taken for use on another Drewry car. Another coche motor for refigerated goods was this one apparently built at Puerrto Madryn. It is seen here derelict at the Km5 talleres. The final railcar photo shows Ganz railcar bodies departing from the Hungarian manufacturer's workshops mounted on flat wagons. The strange emergency buffers can be seen. It is said that the original Patagonian cars (CM1 to CM3) were shipped in parts in this way for ease of transhipment at Patagonian ports. 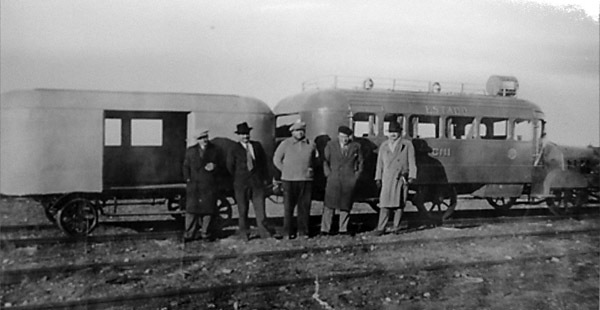 Throughout the life of the Patagonian broad gauge lines a variety of small railcars or 'zorras' were used. By no means all of these have been identified so far. The earliest style of car seems to be this one, seen within one of the sheds at Km. 5. No other views of it have been found. A small autovía seen in snow; location and date unknown. The two photos below illustrate one particular autovía, no. 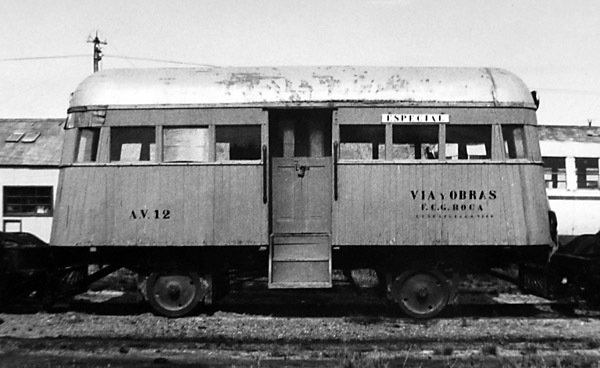 AV12, belonging to the 'vías y obras' department. The builder and date are unknown at present. The tapered ends differentiate this car from that illustrated above, though otherwise they appear to be similar. Annual 'Estadística' reports give the line's total passenger stock as three from 1916 until 1934, though for a period of three years from 1923 there was an additional vehicle. The total rose to five in the mid thirties and then to eight from 1938. After 1944 no loco-hauled passenger stock was reported at all. One of the Harlan & Hollingsworth coaches. also present in ’34, ’40 & ’45. Not present in '56. As detailed in 1912 but converted to coche mixto by 1924. Present in ’34, ’40 & ’45, & '56. Not recorded in 1912 but present in 1924 (arrived 1923? ); in 1934, ’40 & ’45, & '56 numbered S510 and converted to service use (prob. by 1926). 240hp. Only recorded in 1940. With kitchen & compartment for luggage. Three Ganz units here in 1960. Ex BAPR batch 1054-59 later 2401-6. Renumbered CM 53 &54 in Patagonia. 1956 data sheet lists 54-56 here, all with kitchen. Here in 1960 and 1977. No 53 burnt out by 1977. 54 operating until closure of line and then relocated to Rada Tilly racecourse where at one time in use as a restaurant and still present next to the riding school. Ex BAPR no 1062 later 2411. Here in 1960 and 1977 but burnt out by 1977. 5 here in 1956, 1960, and in 1977. Numbers: 59 & 61 (Patagonia numbering), 323 & 500 (Roca numbering) and 453 (Sarmiento numbering, ex official saloon at Remedios de Escalada). 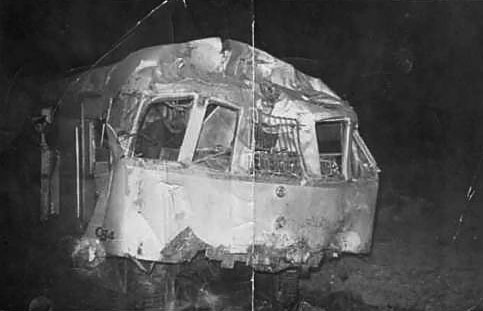 CM54 was also one of those delivered to Comodoro Rivadavia, and involved in the collision with another Drewry car at some point. 1956 list states 57-61 here. One grounded Drewry body survived at Rada Tilly racecourse in 1984. Listed in 1912 & 1924, also present in ’34 & ’45. & '56. 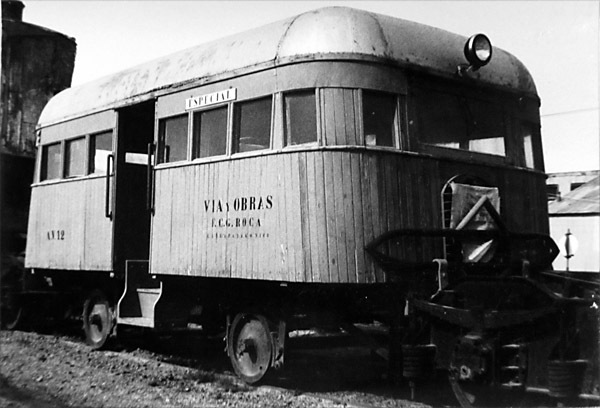 4 wheeled railcar for use by Vias y Obras. Only recorded in 1956 and 1977..
1977 information from Marcelo Arcas' website (4). 1956 nos. from FCP data sheet for Com. Riv. Passenger stock arriving at, or maybe departing from, Comodoro Rivadavia port (5). 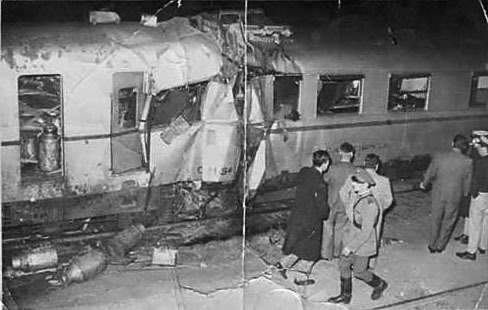 Two Harlan & Hollingsworth coaches, such as these, were removed from the Com. 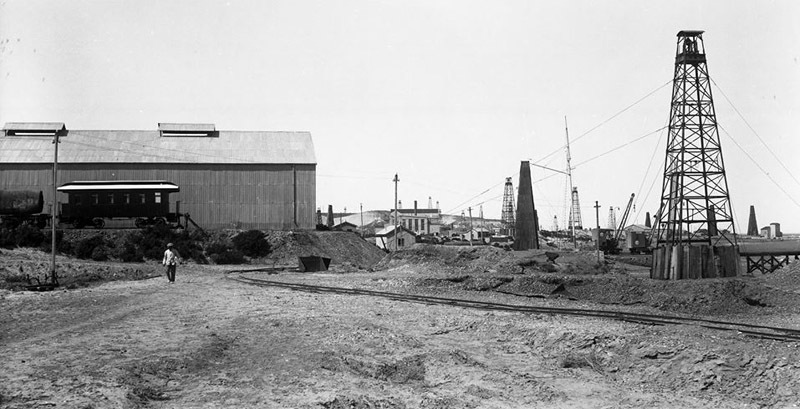 Rivadavia stock between 1945 and 1956. Weight empty 13.10 tonnes. Only 8 of these present in 1924, but all 35 again recorded in 1934, ’40 & ’45, numbered 2185-2219. All 35 also recorded in 1952 tariffs update. 1955 tariff update records 2185-2223. 1956 FCP data sheet lists 2185-93, 95-2215, 17-23. Only reported in 1912, not in 1924, 1934, 1940 or 1945, or 1956. Ex FC Andino $oro 500.00 each. 10 tonnes empty. 12 recorded in 1924. These may be the same. 12 still mentioned in 1934;10 of them recorded in 1940 & ’45, numbered 300-309. Series 300-9 also in 1952 tariffs update. 1955 tariff update reports 300-319 but this may be a mistake. 1956 sheet records 300-8, 12, 14, 16, 18, & 19. 16 tonnes empty. Still 5 present in 1924; and again 5 in 1934 & ’45 (numbered 615-619). 615-9 also listed in 1952 & 1955 tariffs updates, & in '56 data sheet. All present in 1924, but in 1934, ’40, ’45, ’52 & ’55 & '56 there were two left, numbered 940-941. The 1955 update also records the existence of nos. 964-7 as 8 tonne cubiertos. In 1956 nos. 945, 7, 9, 52, 65, & 68 were recorded in service with Vias y Obras. Only recorded here in 1956. Nos. 16668-18565 listed in 1955 tariffs update. Presumably not a complete series! No other details known. None in 1956. 5.10 tonnes empty. Not recorded in 1912, but present in 1924. In 1934, ’40, & ’45 there were 5 'bordes bajos' by Nicaise & Delcuve numbered 445-449 (& built in 1889). Bordes bajos 449-472 still listed in 1952 tariffs update, and nos. 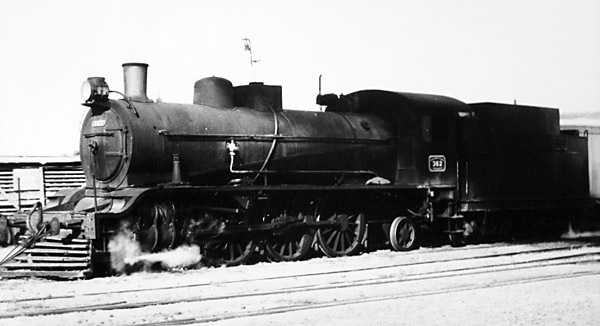 445-472 in the 1955 update. 445-449 in '56. Not recorded in 1912, only in 1924. In 1934, ’40, & ’45 there were 23 'bordes bajos' by Dyle et Bacalan (dating from 1895) numbered 450-472. Bordes bajos 449-472 still listed in 1952 & 1955 tariffs updates. Also see 445-472 listed in 1955 update as mentioned above. All except 453 in '56. 473-492 listed in 1955 tariff update. No other details known. 475 to 492 in '56. Ex FC Andino built 1890. 6 tonnes empty. Not mentioned in 1912 and 1924 but bordes altos 2559-2565 present in 1934, ’45, ’52 and ’55, and '56, and total of 7 in 1960. 16 tonnes empty. 15 of these present in 1924, 15 in 1934 (inc. no. 24 out of service), and 14 in 1940, ’45 and ’52 (numbered 10-23). None in 1956. 4518-20 for petroleum, also 4518 & 20 in '56. 4521-22 for water, also in '56. 4523-24 for diesel-oil, also in '56. 4525-33 for petroleum, also 4525-28, 30, 32-33 in '56. 4534-35 for petroleum also in '56. All listed solely in 1955 tariffs update. One two axle petroleum tank listed in 1960. No other details known. Not recorded in 1912, only in 1924. In 1934, ’ 40 & ’45 recorded as numbered 558. In '56 both 557 & 558. Wagons of series 1002-9 mentioned in 1955 tariff book. No details known. None in 1956. Wagons of series 11040-79 mentioned in 1955 tariff book. No other details known. 9 in total in 1960. In 1956 nos. 11040, 4, 8, 9, 51, 59, 62, 78, & 79. Converted at Remedios de Escalada to take a refrigerated container. In use 1956. By 1977 lying derelict at Talleres with the cab end removed to supply parts for another Drewry. 1977 information from the website of Marcelo Arcas (4). 1956 data from FCP data sheet for Com. Riv. A number of FCE wagon diagrams are available on an appendix page. 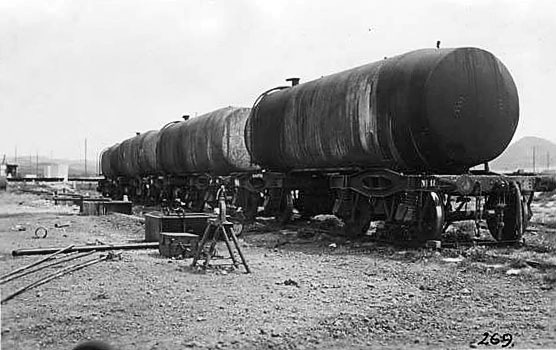 The 'Patagónicos' tankcars, built by Nesseldorf and Ringhoffer. An unusual design of tank wagon. The bogies have coil springs and the tanks have no separate underframe. One of the Lancaster-bult coaches was preserved, in hospital grounds in Rawson of all places, a long way from any broad gauge track! 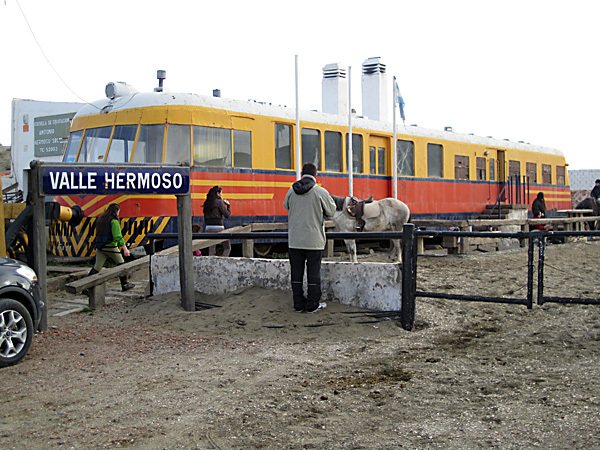 This one was actually the sole first class coach on the Puerto Deseado line for many years. It has recently been moved back south, to a new museum at the old Jaramillo station. As well as the full length Lancaster coaches purchased at the FC Andino sale and shipped south to all three Patagonian lines, Comodoro received a single shorter saloon. This seems to have found a role as staff transport, and is seen below behind the works at Km 5 and then out on the line in the snow. Unlike the other coaches it retained the 'ANDINO' wording beneath the cantrail, rather than the word 'PATAGONICOS' that was applied to the others. 4 The Rumbo al Sud website article by Marcelo Arcas is at<http://www.rumboalsud.com.ar/>. 5 Photos found in the Dickinson College Patagonian Mosaic online archive. 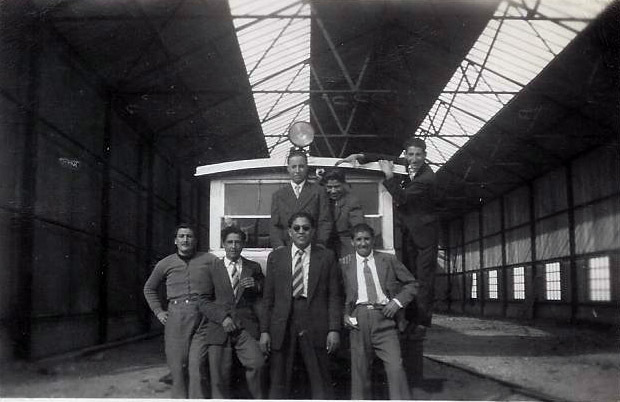 6 Photos reproduced by kind permission of the Museo Ferroportuario in Comodoro Rivadavia. 7 Photos reproduced by kind permission of the Fundación Museo Ferroviario in Buenos Aires.